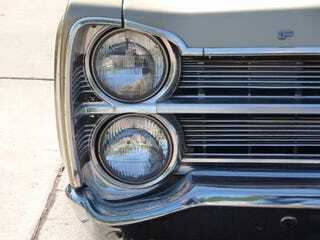 We're still in lovely Costa Mesa, California, where Tomsk photographed this '67 Plymouth Fury for us. The hood ornament and "Commando V8" badging indicate that the car shipped with a 270- or 325-horsepower 383 under the hood (although there's no telling what sort of powerplant lives there now, what with the ready availability of so many flavors of Mopar engines over the decades). Jump like the cost of filling this thing up with high-octane to read Tomsk's observations. This fine specimen of droptop Plymouth was captured in an area of Costa Mesa, CA that houses a veritable treasure trove of vehicles guaranteed to make the dragon in your life have a love explosion in his or her pants. I'll be submitting more of this neighborhood's inhabitants for tha Jalop's collective...er, "viewing pleasure" over the coming weeks, including one vehicle that may very well be the most Jalopnik in all of Orange County (and no, it's not a camino). Until the next one comes along, please enjoy this golden chariot hailing from a time when men were men, smoking in front of the kids was kosher, Chrysler needed a brand below Dodge, and "Commando" had yet to become the title of one of the Governator's most quoted movies.